The winner of the Audience Choice Award went to Weekends by Trevor Jimenez! The 7th Annual Sweaty Eyeballs Animation Invitational returns to the Parkway Theatre with an extraordinary lineup of international, independent short animated films. Curated by Phil Davis (Towson University) and Max Porter (Rhode Island School of Design); including narrative, experimental, and music video work made with a variety of techniques ranging from stop motion, hand drawn, and CGI. Come on out for a night of beautiful and weird animation and cast your vote for the audience choice award! Ainslie Henderson is a writer/director/animator/who in, 2012 was awarded a BAFTA for his co-writing of "The making of Longbird." Ainslie’s films “I Am Tom Moody” and “Monkey Love Experiments” were both BAFTA nominated, and have won over 60 international festival awards, including; Best British short at Encounters, Disney, best student film at Ottawa, the special jury crystal at Annecy and Edinburgh International film festival’s McLaren award. 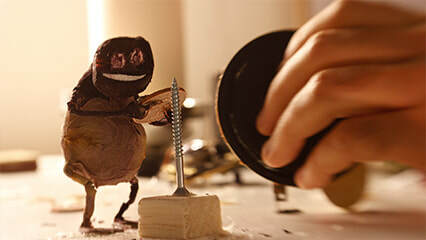 Ainslie has a particular love for stop frame animation and is currently freelancing in Edinburgh. ​Nienke Deutz is a Dutch director and artist currently living and working in Rotterdam, the Netherlands. In 2010 she finished her studies of Bachelor in the Fine Arts at the Academy of Fine Arts in Maastricht, before moving to Ghent, Belgium and graduating as Master of Animation film at KASK. Her graduation film 1,2,3, piano! was awarded a Wildcard from the Flanders Audiovisual fund and her work has been shown in festivals and musea around Europe. Steven’s work uses varied imagery – from cartoon to pure textural abstraction, unusual editing techniques, and carefully structured sound design to make human vulnerability, conflict, and history concrete and to convey a deeply personal aesthetic experience to viewers. KANG MIN KIM is a multiple award winning Korean filmmaker and designer based in Los Angeles. He was born and raised in Incheon, Korea. He graduated from SADI (samsung art and design institute) in Seoul, Korea, from the department of Communication design. He received BFA and MFA from CalArts experimental animation and he has been concentrating on creative visualization using handcrafted media with designed backgrounds. His films have screened internationally at several festivals including Sundance, Annecy, Ottawa, AFI and more. His film, Deer Flower, premiered at Sundance and won the Best Animated Short award at Aspen Shortfest, Melbourne International Film Festival as well as other awards. It was also the only independent animation to compete for the best animated short subject against the works from Pixar, Google, and National Film Board of Canada at the 44th Annie Awards. Luca Tóth studied animation at the Moholy-Nagy School of Design (MOME) in Budapest and at the Royal College of Art in London. She received a number of awards for he graduation short film The Age of Curious, such as the jury distinction at the Annecy IAFF and a special mention at the ITF in Stuttgart. Swedish Director and Animator based in London. Worked in various projects both commercials and feature films, recently animated on Wes Andersons ‘Isle of Dogs’. Her short film 'But Milk is Important', co directed with Eirik Gronmo Bjornsen, won over 20 international awards. And her first year film at the Royal College of Art ‘Enough’ is currently being screened at festivals around the world, and has so far received multiple awards. Anna has just been signed as a Director by Passion Pictures. Albert Birney is a Baltimore based filmmaker. He has directed two feature films, The Beast Pageant (2011) and Sylvio (2017). Rachel Gutgarts graduated from the Animation department at Bezalel Academy, class of 2017. Born and raised in Jerusalem. She has practiced silk-screen printing for the last two years and worked in a DIY screen-print workshop built as part of the independent artist collective STRAUS, based in Jerusalem. Sh is currently based in Tel-Aviv, working as a freelance in animator and graphics editor, while developing new creative projects in the field of experimental animation and documentary filmmaking. She also work as a sushi chef, exploring the depths of the Japanese kitchen. Jeron Braxton is a young self taught award winning animator making waves world wide. His work reflects life thru a black American lens using surreal 90’s video game aesthetics. Dante Zaballa is a frame-by-frame animator from Argentina, who likes experimenting with diverse materials like crayons, acrylics and markers. His work combines seemingly messy hand-drawn lines, raw shapes and flickering textures. CÈsar Pelizer is a London-based illustrator and animation director. Growing up he had always been surrounded by comics, magazines and cartoons which certainly piqued his interest in animation from an early age. Set against coloured backgrounds, his work is always pushing the boundaries of the 3D and is often described as surrealist, bold and colourful. Even when static, there is a real energy to his work. CÈsar's short films has been screened in several festivals around the world including the London Short Film Festival, Clermont Film Fest, Pictoplasma in Berlin and Encounters Film Festival in Bristol. ​Alexandra Neuman is a visual artist working in new media, video, and performance. Her work explores the spiritual implications of human interaction with technology over the course of our evolutionary timeline, from our existence as nonhuman primates all the way to our speculative posthuman futures. She is the past recipient of an award for Best Screenplay at the Brooklyn Women's Film Festival as well as the Morris M. Horwitz Award in Photography. Neuman is an MFA candidate at UC San Diego and received her BFA in Studio Art from Washington University in St Louis in 2015.